The seed coating used during seed breeding can have many purposes, but will often contain fertilizer, growth promoters and fungicides to enhance the seed performance. An uneven coat, however, can lead to insufficient fungus protection and/or unsatisfactory germination. For that reason, it is important for seed and crop science companies to inspect and document the evenness of the seed coat. A digital microscope that displays live images with 60 frames per second will display a magnified seed with no delay or distortion. This makes for ideal quality control working conditions as the monitor will display what is happening underneath the camera in real time. To create photo documentation of the magnified seed sample, the operator simply needs to click a button on the control box. The image will then be saved to the inserted USB memory stick or the internal storage of the microscope, which can be accessed from any computer on the same network as the microscope. This eliminates the need for distributing seed samples. Instead, the captured image documentation can easily be shared with customers and coworkers. Another key benefit of using a digital microscope is the ergonomically correct working position obtained by not using an ocular for focusing. By using a monitor instead, the operators’ eyes, neck and back are relieved of excessive strain. Cases show that the improved working position results in less sick leave and staff infirmities. 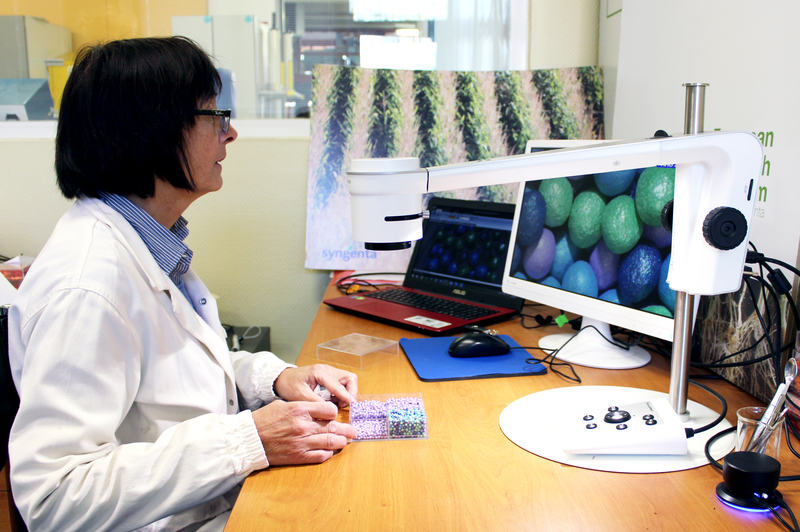 TAGARNO’s digital microscopes are used for visual inspection of seed and grain samples in various ways. By combining FULL HD cameras and user-friendly software, the digital microscopes can be used to analyze and document samples in excellent image quality.